Connect to your Apple Music account through the Musish web portal. A new service allows Apple Music access through a web site without requiring any new software to be installed on the computer. Musish is free to use, and is far more secure than one might think. The simple design of this portal is reminiscent of the Apple Music app. “When a user clicks our ‘Connect to Apple Music’ or ‘login’ buttons we open a new browser window under the Apple.com domain. We do not have any access to this window. 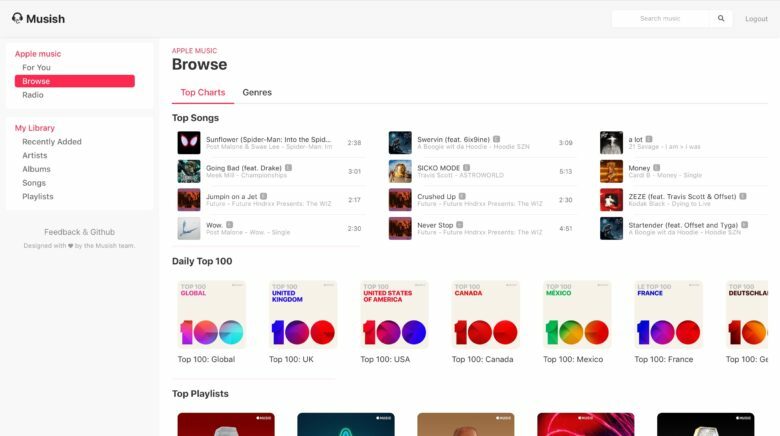 After a user logs in to Apple.com, they will be prompted with an access request to allow Musish to access Apple Music, media library, and listening activity for their account. This unofficial Apple Music web portal can access the songs users have already purchased. And playlists are available as well. It was created with Apple’s own tools. “Our service is built using official public Apple Music APIs and Apple’s official MusicKit JS library.” said Bennett-Odlum. The designers of Musish were clearly inspired by the Apple Music app. The layout of the two aren’t the same but both have simplistic designs with icons on a white background. It’s up and running now at musi.sh. And this is an open-source project so the code is available from GitHub. This isn’t the first website that can connect to Apple’s streaming music service; playapplemusic.com debuted last month.